Large format printed banners are one of the most cost-effective and versatile promotional graphics. CSDPrint produces thousands and thousands every year. Printed onto to high-grade PVC these banners can be placed indoors or outdoors and can be attached to walls, railings, fences, and walls. They can be hung from ceilings or suspended from scaffolding and we also supply framed large format banners that are free-standing. 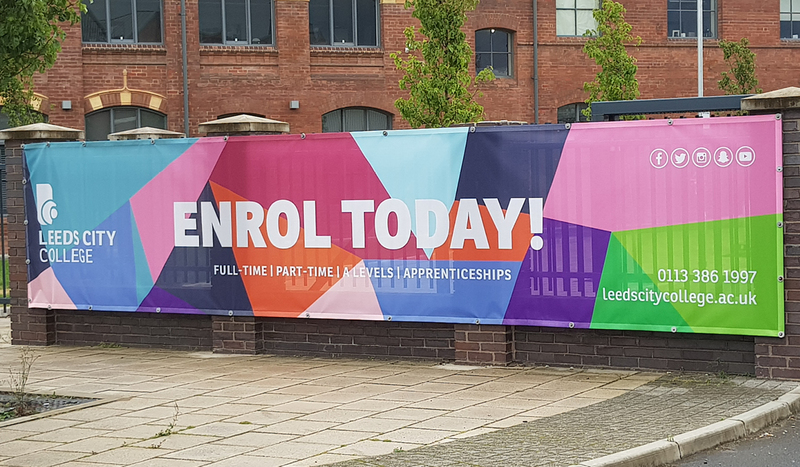 We have invested extensively in all the latest wide format digital printing and finishing equipment to make sure we can offer the highest quality banners. It also means we are able to provide a quick and flexible service. Our banner printing customers include; advertising and marketing agencies, shop and restaurant owners, motor dealerships, exhibitions and trade fair organisers, construction contractors, festival and event organisers, universities, schools and colleges and local authorities. In addition, to standard PVC large format banner graphics CSDPrint also produces freestanding framed banners, wind resistant mesh banners and illuminated material banners. We can produce almost any kind of large format banner you might need. Here is a brief overview of our most popular formats, please get in touch if you can’t see what you’re looking for. These banners are also referred to as A frame banners. They are landscape in format and are perfect for large outdoor advertisements. Easy to assemble, framed banners are excellent for verge-side promotions. Durable elastic bungee cords are used to attach your printed banner graphics to the frames. All the components such as the aluminium frame tubes and plastic joints are high quality and are designed to tolerate 18-24mph winds. Our A frame banners measure: 1000 x 2500mm. The hardware dimensions are 975mm high x 2500mm wide x 640mm deep and the visible graphic dimensions are 840mm high x 2340mm wide. They weigh approximately 8kg. Mesh PVC is perforated. It is designed to allow wind to pass through it more easily which means it is ideal for banners to be used in outdoor locations. Be assured the material’s holes do not affect the quality of the printed images. Our high-spec digital technology is able to print high definition full colour images to a really high standard. These tensioned, illuminated high impact banners are great for indoor or outdoor locations. Some of our retail clients use backlit banners in their stores. We’ve also made large format flex banners for hotel and tourist attraction interiors. Exterior banner applications we’ve supplied include shopping centres, offices and restaurants. If you have any queries at all about what size, format, finish or fixings you need please get in touch.